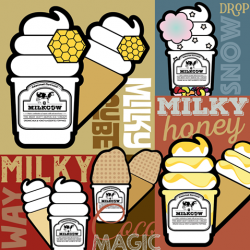 Milkcow is a hand-made, soft ice creamery, originating from Seoul, South Korea. With FOURTEEN different ice cream topping combinations to choose from, customers can enjoy various experiences every time they visit Milkcow. 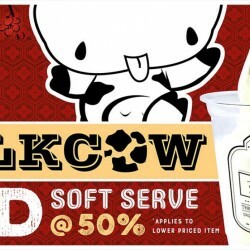 In conjunction with Jurong Point this Lunar New Year, Milkcow @ JP1 (‪#‎B1‬-27) will be offering Buy 1 Get 2nd One at 50% Off! Promo ends 7 February 2016. So if you have not tried Milkcow yet, wait no more! Bring a friend along too! With a brand name like Milkcow, you know that its ice cream is definitely creamy and moo-licious! Singaporeans have been flocking to this shop famous for its organic and healthy soft serve ice cream with FOURTEEN different ice cream topping combinations to choose from! If you live in the west, you are in for a treat. Milkcow from Korea is opening their 6th outlet at IMM on 4 July 2015, Saturday and giving out 150 free Organic Soft Serve Ice-cream from 12pm onwards. So, see you there guys! -Limited to one redemption per person. To redeem your free Organic Soft Serve Ice-cream, simply like and share Milkcow Singapore Facebook page and this post. - Limited servings of 150 free Organic Soft Serve will be on a first come first serve basis. - Choose your favourite flavours from M1 to M5. Spread the joy with MILKCOW Singapore ! MILKCOW Month-sary is MARCH-ing near! To celebrate their 1 month milky birth in Singapore, MILKCOW is giving away FREE MILKY WAY to you IF YOU ARE BORN in the month of MARCH! All you need to do is to bring 2 friends with you (need not be born in the month of March) together with your NRIC / Passport on your ACTUAL Birthday, and the power of 3 MILKY WAY Soft Serve will be on the house! Promotion ends 31st March 2015, 9pm.